In China, two people have died after they were infected with the avian influenza H7N9, a subtype that previously was not transmitted to humans, said government officials Sunday. In February, a Shanghai man who was 87 years old fell ill and died March 4. Another man who was 27 became ill February 27 and on March 10 died, said a government website. A woman who is 35 years of age and lives in Anhui, an eastern province, became sick March 9 and is currently listed as being in critical condition. Each of the three suffered cough and fever initially and then developed a severe case of pneumonia followed by difficulty with breathing. All three cases had been confirmed to be H7N9 infections after medical workers in China did analysis on body samples on Friday. 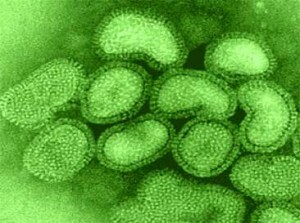 Government experts in medicine said this H7N9 strain has not been transmitted prior to this to humans. The health commission in China also released a statement that said no vaccines were available against the new strain of influenza. The commission also said there had been a delay in announcing the sample results because it took additional time to determine the cause of the sickness. World Health Organization officials said that no evidence existed that the transmission had been human to human in any of the three cases that had been reported. The WHO also said that transmission to a human appeared to be inefficient leading them to believe risk to the public was low. China is considered a nation at high risk from avian flu because the biggest population of poultry in the world is in the country and often times in rural areas chickens are kept in close proximity to humans.